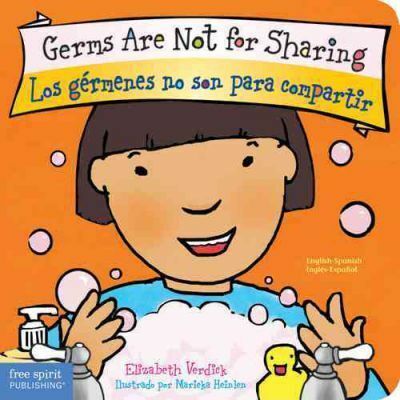 "Germs Are Not for Sharing/Los germenes no son para compartir" board book (ages 0-4): In childcare, in preschool, at home, and everywhere, toddlers need to learn that germs are not for sharing. This friendly board book teaches the basics of not spreading them: Cover up a sneeze or cough. Hug or blow kisses when you're sick. And most of all, wash your hands! Includes tips for parents and caregivers. Elizabeth Verdick is the author of more than thirty highly acclaimed books for children and teenagers, including books in the Toddler Tools(TM) board book series, the Best Behavior series for young children, and the Laugh & Learn(TM) series for preteens. Her most recent titles include "Bedtime" and "Calm-Down Time" from the Toddler Tools series and "Don't Behave Like You Live in a Cave "from the Laugh & Learn series. Elizabeth's daughter and son are the inspiration for nearly everything she writes. She lives with her husband, two children, and five pets near St. Paul, Minnesota. Marieka Heinlen received her BFA at the University of Wisconsin, Madison, and also studied at Central Saint Martins College of Art and Design in London. She launched her career as an award-winning children's book illustrator with the original edition of "Hands Are Not for Hitting" and has illustrated all of the books in the Best Behavior and Toddler Tools series. As a freelance illustrator and designer, Marieka focuses her work on books and other materials for children, teens, parents, and teachers. She lives in St. Paul, Minnesota, with her husband, son, and daughter.